Belonging to the Mughal era and close to the Nilkanth shrine, this palace was constructed by the Mughal governor, Shah Badgan Khan for Emperor Akbar’s Hindu wife. On the walls here are some inscriptions of the time of Akbar referring to the futility of earthly pomp and glory. Hathi Mahal, Darya Khan’s Tomb, Dai ka Mahal, Dai ki Chhotti Behan Ka Mahal, Malik Mughit’s Mosque and Jali Mahal are some of the other fascinating monuments. 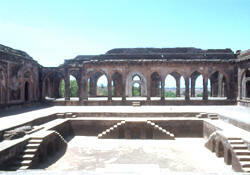 There is also the Echo Point, the ‘Delphic Oracle’ of Mandu. A shout from here reverberates far below and is heard clearly back. The Lohani Caves and Temple Ruins, not far from the royal enclave area also merit a visit due to their association with Mandu’s history and monuments. Sunset Point, in front of the caves affords a panoramic view of the surrounding countryside. This entry was posted in Madhya Pradesh, Nilkanth Mahal. Bookmark the permalink.